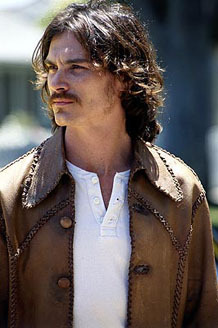 Billy Crudup has a wealth of stage experience, winning on and off-Broadway awards for dramas including Anton Chekhov's Three Sisters and Tom Stoppard's Arcadia. In films, Crudup has stuck to in serious-minded roles, usually in smaller, art movies such as Jesus' Son, Big Fish, and Stage Beauty. He reportedly turned down the lead in Titanic and Hulk. "I never intended to shy away from admiration or adulation. Believe me, I want people to like my work, I want people to see my work. I feel that a movie like Jesus' Son [in which Crudup played the drug- and alcohol-addled FuckHead] should have been seen by millions and millions and millions of people. Why it wasn't is beyond my comprehension, but it is not my intention to appeal to a limited audience." Crudup is probably best known as the rock star in Almost Famous, shouting "I am a golden god!" before jumping off the roof. Since 1997, he has been the unseen voice of MasterCard's "priceless" commercials. His parents divorced when Crudup was in junior high school, and remarried each other a few years later.